More Than Paper is pleased to introduce a new weekly blog feature: Gift inspiration of the week! Each week, we will introduce you to one great product at our store. With over 20,000 products at More Than Paper, this could be a real challenge for us to choose just one! But there are so many great gifts that we are inspired by, we can't wait to share our recommendations with you! So what's up first? It's something that you would never buy for yourself so it's a perfect gift. This personalized soap set is great for hostess, housewarming, bridal or birthday. 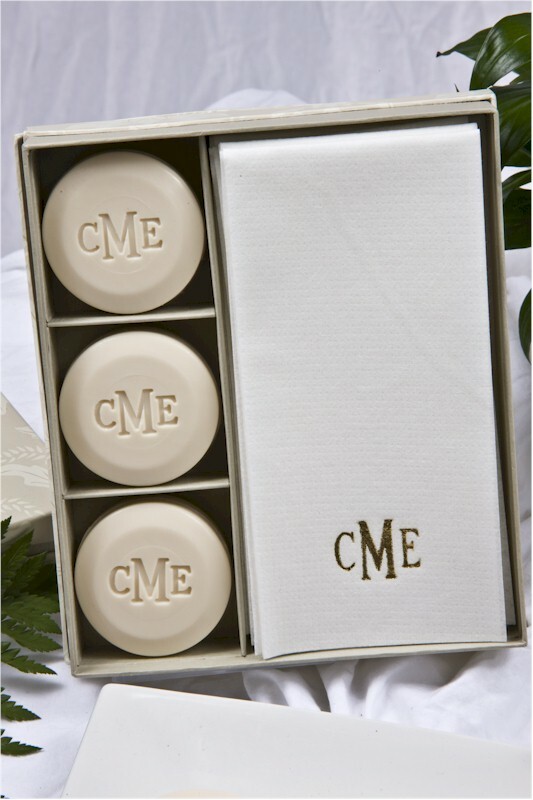 In addition to 3 personalized soaps, the set comes with 12 linen-like personalized white guest towels in a beautiful gift box ready for gift giving! Each Vermont-made soap bar is a generous 3 or 4 ounces, individually personalized and intricately carved. The soap is 100% vegetable based and it's triple milled for a luxurious lather. It has a gentle yet intoxicating scent. You can choose from three different aromas: Aqua Mineral (water-based, simple, gentle & clean - safe for sensitive skin and noses), Verbena (known for its uplifting, relaxing and soothing qualities) or Honey Almond (known for its balancing and relaxing.) The set is normally $35.00, but we are selling it for just $31.50. While we know you don't really need monogrammed soap, that's what makes this gift extra special. Head on over to More Than Paper now to shop this monogrammed soap and towel gift set!